If you’re anything like me, you always need belated birthday cards – I am so bad about getting cards out on time! Well today, get ready for some SQUEEEEEEEEEEEEE over the cutest lil elephants ever! 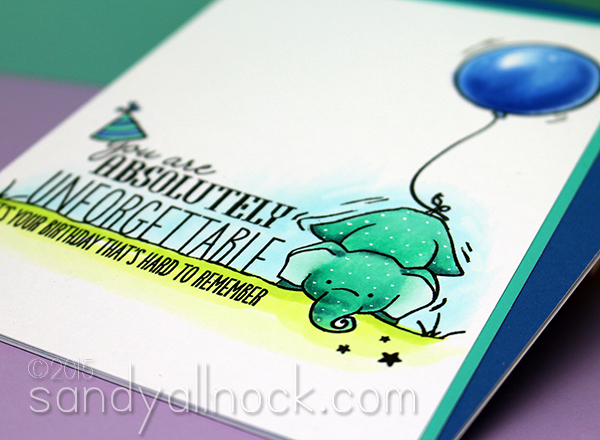 This lil elephant is from the brand new WPlus9 stamp set called “Unforgettable” that’s releasing today – ohmygosh how CUTE, isn’t he?? In the video, I show you how I *finally* got to make a card on which I could deliberately create a tilted panel. My backgrounds never quite work with this style of card, and I think it’s so fun to combine the angles like this! But text on an angle makes me nuts, so I had to figure out how to achieve this without my stamped sentiment going wonky. Find out how in the video below, or click HERE to watch in HD on YouTube. Isn’t that just so much fun? And so simple too. Maybe others have long-ago figured out the secret to the kittywompus panel, but I’m slow to tackling things sometimes! But I am just so thrilled to have this stamp set and need to work on more belated birthday card ideas with it – and maybe I’ll even delay some birthday cards just so I can use these cute elephants! I’m sure if it’s a card this cute, no one will mind getting it late! Besides elephants being great for belated birthday card ideas – since they apparently never forget – I also have a ‘thing’ for elephants – so I especially love this little stamp set. The colored pencil drawing below is one I created wayyyy back in 1998 (GASP!). 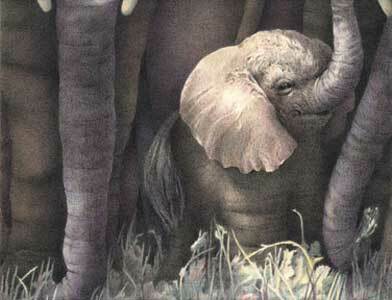 I had a dreamone night that I was a baby elephant, surrounded by legs! Click on the image to see some more of my art from back in the day. PS! I wanted to say a big thank you to all of you for your lovely comments on my Toastmasters Speech uploaded yesterday. Oh MY! I never quite expected that outpouring. Please know that my inbox is flooded with life-stories right now, and since I am heading out of town shortly, I may not get to replies for some time. Can’t wait to order the stamps. Gorgeous card and love your tutorials Sandy! Cute unforgettable elephant and I believe I can, with God’s workmanship, now make a cool-lookin’ balloon. Thanks. What a cute card. I love this little guy. Love that baby elephant– you made that? So amazing! And your card is cute too!! Whales have been my favorite animals but elephants are coming in close. Especially since I read Jodi Picoult’s latest book, Leaving Time. It stayed with me for a long time, but I love what she said about elephants! I stayed up to be able to order this stamp and die set at midnight this week, so it is on its way! I LOVE seeing how you used it – terrific!!! this was so fun to watch Sandy! love thawed you colored the elephant! Oh this is just too cute! I’m ordering that stamp set and matching dies right now! I JUST ordered this stamp set and cannot wait to use it. I LOVE elephants myself-they are my absolute favorite animal. This card is amazing. I love that you didn’t color in the elephant gray but made it a fun green with little polka dots. This card is so fun!! Your little forgot your birthday elephant is adorable. Love the card. Great way to remember birthdays. I have them in a book, by month and date and year. So as I do the card, I circle the date and name. Works for me. Oh, Sandy, this is one adorable elephant set!! And your drawing is amazing! I love the tip about allowing an image to dry…very helpful! Amazing as always, and thanks for sharing your great organizational plan for sending personal cards…I’m so bad myself. Hugs! I think I can feel myself becoming a fan of little elephants! I’ve been waiting for this release for the new inks, but I’ll have to have this little guy too.. Thanks for a card that is wa-a-a-y cute! Adorable card, I love elephants, they are such amazing animals. My question is a little “off the wall,” but I never know whether to leave comments here on the blog or on YT. Which, if either, would benefit you more? I read both 🙂 If I have giveaways sometimes I say to comment on YT or here, so watch for instructions! I loved your Toastmasters speech. Keep up the good work. I definitely want to order that stamp. I don’t think anyone minds getting a belated card from you since they are all amazing, including this one.